The transceiver may get all the glam when it comes to rescuing someone from an avalanche burial, but it’s the shovel that does all the heavy lifting. Digging is typically the slowest part of the rescue and, with the chances of survival sinking fast after 15 minutes, it’s the most important skill to hone. That’s right, there’s a skill to shovelling—at least when it comes to uncovering someone buried in an avalanche. But don’t worry, it’s as easy as A, B, C and D.
A IS FOR AIRWAY After hitting the victim with a probe, leave it in place and then move downhill to limit how much you tromp around above them to protect their air pocket. B IS FOR BURIAL DEPTH Check your probe. If the victim is buried shallower than a metre, start digging just downhill of the probe. 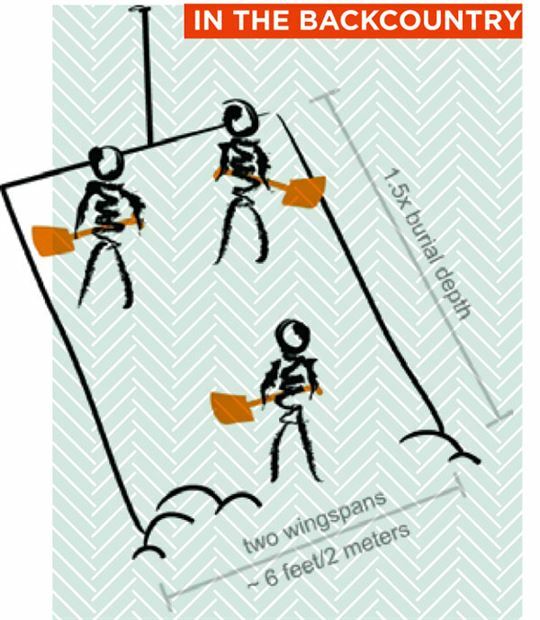 If it’s more than a metre, move 1.5 times the burial depth downhill and start digging. C IS FOR CLEARING SNOW But not randomly. Start by moving snow to the sides. Work side by side with a partner or if solo, clear an area equal to your reach—about one or two metres wide. Working from the knees is often the most ergonomic. Shovel with your whole body, breaking the snow into chunks before moving it. Once the pit is waist-deep, then start moving the snow downhill. D IS FOR DIG ONCE Uncovering a victim is more a middle distance than a sprint race. Don’t waste energy. Unless you have a big team, move any block of snow only once.